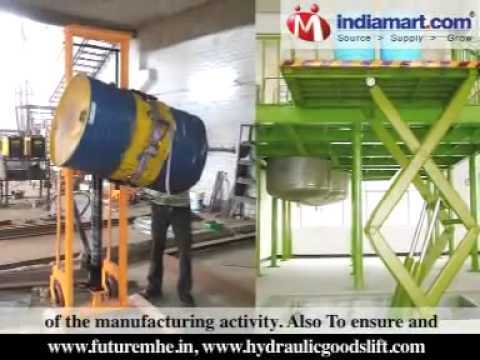 Future Equipment&#039;s is a &quot;Synonym&quot; for highest quality and superior customer services and also a market leader in the material handling and storage solutions industry in India. Since its set up in 2009, we have gained strong reliability and patronage from our esteemed clients by providing intelligent and accurate material handling solution and storage solutions. Future Equipment&#039;s &quot;distinguishes itself in the industry by focusing on the each individual customer&#039;s need and by paying complete attention in addressing its respective customer&#039;s quarries of Material Handling and Storage. The wide spectrum of product range includes Manual hydraulic pallet truck Manual hydraulic, power-pack operated & battery operated stacker. Die loader Hydraulic scissor lift Drum handling equipments like, drum trolley, drum lifter , drum jockey & drum rotator Platform trolley Wheels of C.I., U.H.M.W., H.D.P.E. & Rubber Coated Aluminum Ladders All products and designs adhere to Indian Standards. We are carried out by such machines to ensure the Quality-Control at each and every process of the manufacturing activity. Also To ensure and maintain the service standards, we have a dedicated team for after sales support. We are successfully catering to various industries like Pharmaceuticals, Bottling Plants, Paper Industries, cement plants, sugar industries, steel & pipe plants and many more. We look forward to have a long term mutually beneficial association with our esteemed clients. Some of our esteemed clients are TOYOTA, ADITYA BIRLA GROUP, ITC LIMITED, JYOTI LTD, TATA, ISRO, NTPC, BOSCH, INDIAN OIL, ASHOK LEYLAND and many more. We have a large base of clientele in different parts of Australia/NZ, Caribbean, North Africa, East Europe, Central America, Middle East, South/West Europe, North America, Indian Subcontinent, East/Middle Africa, South/West Africa, East Asia, North Europe, South America & South East Asia.